While in theory you can knock off a drive to Key West from either the Miami or Fort Lauderdale Airport in under four hours, there’s a better way. Turn it into a Miami to Key West road trip, taking three to six days to experience the sights and taste the local food. Tour and Taste at Florida Keys Brewing Co.
From Miami to Key West it’s all of 160 miles via the Overseas Highway. While some of the drive is slow going as you crawl through towns, much of it is fast on four line highways. Go with the flow. This part of the US feels like it’s on a different time zone than the rest of the country. It’s a holiday so you might as well enjoy the ride. There are over 1000 islands that make up the Florida Keys – but of all of those islands, only a fraction are actually inhabited. And even those that were affected by Hurricane Irma in September 2017 have made a massive recovery effort so except for missing vegetation, most visitors now would hardly notice a thing. Listed below are some of the islands, towns, attractions, restaurants and hotels that are well worth a visit. As you head south on your Miami to Key West road trip make Key Largo your first stop. While snorkelers and divers will definitely want to check out John Pennekamp Coral Reef State Park (located at Mile Marker 102.5 on the Oceanside of the highway) where you can explore the “most accessible living coral reef in the US,” hikers can also enjoy nature trails in the park. Include a stop at the Fish House Restaurant and Seafood Market when you’re in Key Largo. Dine on large portions of fresh locally caught seafood. I highly recommend the blackened grouper sandwich. But nix their Key Lime Pie. As the sportfishing capital of the world Islamorada is appropriately called the fisherman’s town. It’s a great place to spend a few nights with plenty to do in the area. Amara Cay Resort – called a Top Resort in the Florida Keys by readers of Conde Nast Traveler would be my recommendation of where to stay. It’s got a laid-back vibe – cue the hanging chairs in the lobby and a clean, fresh aesthetic. Located on the ocean side of the Keys, it boasts 110 rooms, many with pool and ocean views. Swaying palm trees, lounge chairs galore and a pool with a tiki bar are just some of the amenities. The resort loves kids and offers plenty for them to do as well. If you want to drink but not drive, take advantage of the shuttle service to restaurants offered by the resort. We enjoyed two outstanding dinners in nearby restaurants. One at the Angler and Ale on Duck Key was a more casual affair than the romantic, beautifully situated Morada Bay Beach Café. Seafood is prominently featured on both menus – as is Key Lime pie. There were only winners here – with lobster mac and cheese always a stand-out menu item. On your first morning in the Florida Keys, head to Robbie’s Marina, a popular spot with both locals and visitors alike. While it’s the starting point for several water-based activities like deep sea fishing and kayaking, it’s also the place where you can both feed the tarpon – and eat at the Hungry Tarpon Restaurant. (Cool fact: Large tarpon will literally fight to the death when caught.) It takes an act of faith to dangle a dead fish over the edge of the dock, waiting for tarpons that weigh up to 100 pounds to take the bait. There were plenty of screams heard when it happened – not that it was unexpected but it happened so fast. Rumour has it their teeth feel like sandpaper – but tell that to the lady who works there who has small scars on her arms. A bucket of fish is $4. I tried it and lived! Would you put your hand near this tarpon’s mouth? Breakfast may be slow in coming, but when it arrives expect monster sized portions – and endless cups of coffee. Finish a visit here with a look through quirky craft stores onsite. Don’t forget to say hello to Donald, the formally heartbroken mallard duck down on the beach. He lost his mate in Hurricane Irma and spent weeks walking around quacking with grief. Fortunately someone at Robbie’s had the wherewithal to do some research about grief stricken mallard ducks. Racer ducks that can’t fly saved the day. A number were purchased and while Donald initially hated his new companions, he has come to love them, even though he is no longer number one in the pecking order. Robbie’s is open from 7 AM until 8 PM. Admission to the dock to feed the tarpon – or just watch and listen to screams is $2.25 per person. Not far from Islamorada is Marathon. 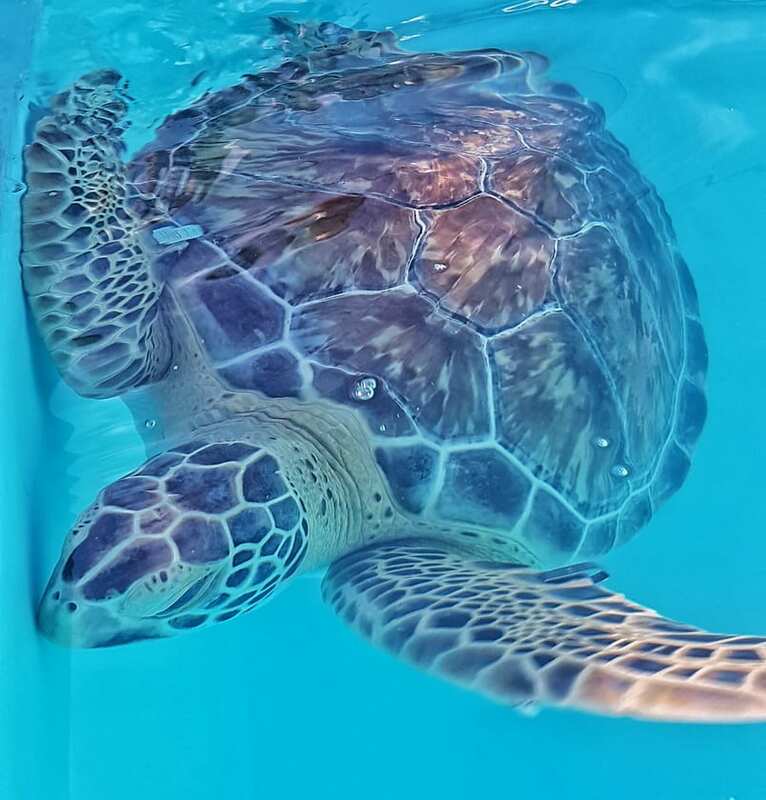 Its home to the Turtle Hospital which is most definitely worth a visit, especially if you have the passionate Christine Watt as an educator and tour guide. Over an hour you are walked through the five different types of turtles that are found in the Florida Keys (Loggerhead, Leatherback, Hawksbill, Kemp’s Ridley and Green sea turtles), their diet, what they end up eating but shouldn’t and a little bit about each sea turtle that’s in the hospital right now. Some are permanent residents – as they have too many ongoing medical problems to be released to the wild, while others are in for a short time only. Take a tour of the operating room and then of the pools the turtles call home. Hear the stories of success and failure and leave inspired, knowing that there are dedicated people all over the Florida Keys doing their best for sea turtles. Hand’s down in my books, the Keys Fisheries is the top place between Miami and Key West for lunch – at least of the many I tried. It’s a low key spot where you order, grab napkins and plastic cutlery, find a picnic table with a view of the Gulf and then wait for your order to be called. The fish is super fresh, absolutely delicious and well-priced. Ruddy turnstones (a type of bird) will keep you entertained while you eat. Their Key Lime pie in an uninspiring plastic container has just the right amount of tart and sweet to make it the Florida Keys winner, beating out seven other restaurants though granted there were a few other pies that came close. Anyone who knows me well appreciates that I’m not into beer. But when there’s a good story behind a brewing company and when that brewing company is half owned by a transplanted Canadian then I’m happy to give them some love. The Florida Keys Brewing Company, located in Morada Way’s Arts and Cultural District in Islamorada has expanded since it first opened in 2015, and now has a location on the Old Highway as well. Visit not just for the great beer infused with flavours like Key lime, hibiscus, local honey and citrus but for the cool vibe and the truly great aesthetic of the place thanks to Cheryl, the wifely half of Canadian co-owner Craig McBay. The tasting house is open every day from 12 PM to 10 PM. Bahia Honda State Park is an hour down the road from the Amara Key Resort. Allow an hour or two here to wander the beaches, perhaps go for a snorkel and to check out the old railway bridge that was partially destroyed during the Labor Day Hurricane in 1935. I visited Bahia Honda State Park almost four years ago and the biggest change I noticed is the state of the palm trees and the decreased amount of vegetation. It’s still got great bird life, white sand beaches and glorious views. The park is open from 8 AM until sunset every day at a cost of $US8 per vehicle. On the drive south to Key West make a detour to No Name Pub on Big Pine Key for lunch. On the way you may get lucky like we did and spot some Key Deer, the smallest of the North American deer. It is only found in the Florida Keys. The No Name Pub isn’t easy to find – but they pride themselves on that. Walk in and you’ll be met with dollar bills filling every square inch of wall and ceiling in the place. Again, you’ll find large portions and lots of seafood and pizza. When you finally reach Key West, less than an hour’s drive away from lunch you will have arrived in an iconic city made famous in part by author, Ernest Hemingway. This part of the Florida Key’s is just 90 miles from Havana, Cuba. The Mallory Square sunset celebration is a daily event that starts about two hours before the sun goes down. Watch street performers, get something to eat, drink from a coconut like I did and be sure to grab a good spot to watch the sun go down well before it starts its descent. At Kermit’s Key Lime Shoppe, enjoy Key Lime Pie on a stick. Taste test your way through the shop, trying key lime peanuts, cookies, jellybeans, olive oil and more. It’s a great place to get a gift for someone at home. Also newly opened last year is The Perry Hotel Key West at the Stock Island Marina Village just outside of Key West. Although I didn’t stay here I wish I had. It’s got a fabulous aesthetic, a gorgeous pool and a superlative restaurant (Matt’s Stock Island Kitchen & Bar) where we enjoyed an outstanding, creative dinner including an appetizer of fresh seafood presented in a fishing tackle box. The islands in the Florida Keys are like nowhere else in the US. You’ll feel at times that you’ve been transported to the Caribbean – what with the turquoise blue water, white sand beaches and laid back vibe. Now go see for yourself. As a side note, should you only want to drive one way between Miami and Key West, there is a small airport in Key West with direct flights to Miami, Fort Lauderdale, Tampa, Orlando, West Palm Beach, Atlanta, Charlotte and Newark. There may be others too. It’s a little airport that’s a dream to fly in and out of. Thank you to Florida Keys & Key West for hosting my stay. All thoughts as per usual are mine alone. Visit their website for lots of other ideas on what to do and where to stay.